I have a confession: I have total Holiday wreath craft envy. I spend hours pouring over Pinterest, oogling the beautiful wreaths and wishing I could pull them off! Sadly, if there’s a “crafting gene,” it didn’t quite make it to me. Oh sure, I have grand ideas for stunning crafts. If you could hook a 3D printer up to my brain, sheer brilliance would come flying out! It’s the execution that falls short. Since I can’t make amazing bauble wreaths, couldn’t tell you the difference between evergreen and fir, and don’t actually know what a “wreath form” is beyond “something round,” I’ve made it my life’s mission to come up with easy crafts that people like me can make! People who got skipped over in the crafting gene department or just don’t have more than half an hour- if that!- to create complex crafts. Today, I’m sharing an easy holiday wreath craft that you can make with the kids! What is your favorite indoor family activity during the holidays? Have you tried hot TruMoo Chocolate Milk yet? Wreath form of some type. I got a small Styrofoam one because it was easier to work with. You can also use a pool noodle if you have one left over from summer. They work really well. Just join the ends together to form a circle, then tape it to hold it like that. TruMoo Chocolate Milk! This is for sipping on while you’re working. Heat it up and try it hot, it’s delicious! Plus the jug makes a great “holder” for leaning your project against. Scissors, in case your duct tape doesn’t tear nicely, and for cutting the ribbon at the end. Garland or other embellishment for hanging it when it’s done. 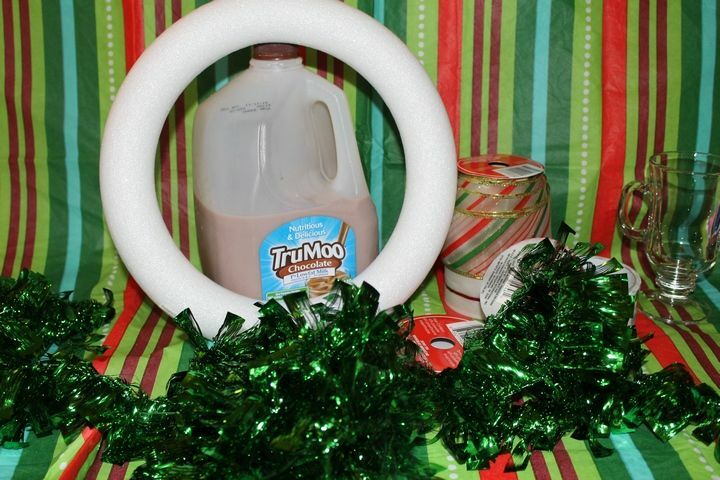 Heat up your yummy TruMoo Chocolate Milk to fuel up for crafting fun. Nothing gets you in the spirit of the holidays better than a hot cup of chocolaty goodness! Decide on your pattern for the colors. I alternated two different duct tape patterns, one with a large polka dot pattern and one with a small one. Get your kids involved here! Pull off a bit of tape and measure it around the wreath form, so you know how much you need. Wrap it around so the front looks pretty. Don’t worry about the back, this is a craft that will be hung up and viewed from one angle only. Kids can help by prepping the tape. Older kids can also do the wrapping part. Go around the entire form, alternating tape, until it’s completely covered. Next, take your ribbon and start wrapping it around the form, using it to cover the spots where the tape intersected.Secure the first piece with tape in the back. Every so often, secure other spots in the back with more tape. Go all the way around, then secure the last piece and cut. Add your “hanger.” I used green garland to give it a little contrast. That’s it! Grab another glass of TruMoo Hot Chocolate Milk, you earned it! A few things: don’t worry about getting the tape perfect around the form. By the time you add the ribbon and the garland, you really won’t notice all the mistakes. And if you do? So what! It’s supposed to be fun! It’s the holidays! I think so many of us avoid making crafts because we’re worried that they won’t come out like a magazine picture. Guess what? Those people are like professional craft people, with photos shot by professional photographers. Please don’t ever let the “perfect picture” keep you from pulling out the craft supplies and trying to make something pretty. I almost tossed my craft because the ribbon didn’t line up perfect and the tape wrinkled in a few spots. But that wouldn’t be practicing what I teach, now would it? Also, as you can see, someone in my house LOVES TruMoo! I’m lucky I got to it when I did! With the cold months coming, Jake will start drinking his TruMoo hot every so often as an extra special treat. Since it’s made with real milk and just the right amount of chocolate, we both love it. I love it because it’s free of growth hormones and other nasty stuff. He loves it because it tastes great. TruMoo is available in stores nationwide, so get it while it’s cold…then heat it up! Visit TruMoo on Facebook to keep up with news. Try it Hot with TruMoo on Pinterest for loads of inspiration! That is such an adorable craft and so so easy! I love trumoo. I could drink chocolate milk all day every day! LOVE That chocolate milk! The holiday wreath is so cute – I need to get ready for the season! Making crafts with kids is always fun. And making crafts with Tru Moo standing by for refreshments make the whole experience even better. I love TruMoo but have never tried it hot. Sounds like the perfect beverage for a cold fall night. I have never tried TruMoo but I would like to as I love hot chocolate. I need to do some holiday crafting real soon! SO cute. Ohh and I never thought to try it hot. I think we will and add marshmallows. That wreath looks awesome! My kids love Trumoo! That wreath is adorable. I know my daughter would love to make it. She loves TruMoo, too! Turned out very cute. I need a new wreath. I love how your wreath turned out!! We love Trumoo in our house, it’s always the kids favorite drink. This is so pretty! I’d love to hang one on my door. I think we’ll definitely be drinking some TruMoo too! This is such a fun, easy craft to do with kids! I always love another way to make the house look more festive! Looks like you have found a fund way to make a wreath that even I can do! I think that will make this to hang on the door. How fun. My kids love making things with me especially if we can put it out for the holidays. I think they’d love this! I wish we had TruMoo in Canada, I think we’d all love it! This is a great craft to do with kids. There is such a selection of duct tape out there. Even though my children are older they may still enjoy doing this. I love TruMoo chocolate milk! We love building tents when it’s cold outside! I love this wreath! I think it was genius to use tape. It’s cute AND it’s easy. I do like the wreath, that really is quite simple to make, maybe next year there is way too much going on for me to have time this year.